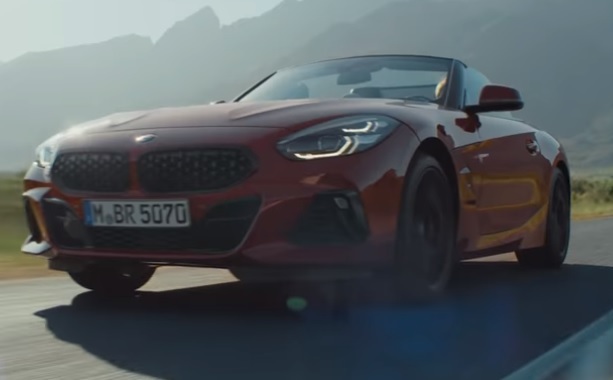 BMW presents the new Z4 M40i, which combines the performance of a sports car with the freedom of a two-seater convertible, as a head-turner in a new commercial. The spot opens with a woman walking a bunch of dogs who are wearing, just like the woman, neck braces. Several other people, of all ages and backgrounds, are also seen wearing a cervical collar, and soon viewers get to understand why: they have been turning their heads to watch a BMW Z4 M40i. Getting at the steering wheel after work, the car’s owner asks the voice-enabled BMW Intelligent Personal Assistant to set as next destination the M Town office. On his way, he makes many other people turning their heads and suffer neck pain, judging by their reaction. Built on a chassis developed in-joint by both BMW and Toyota, the Z4 M40i has a B58 engine, which makes 382 hp and 369 lb-ft of torque, has an electronically-controlled limited-slip rear differential as standard equipment, and goes from 0 to 60 mph in 4.4 seconds, according to the brand. 18-inch wheels, LED headlights, Variable Sport Steering, adaptive dampers, heated seats and steering wheel, and Apple CarPlay also come as standard features. The Z4 M40i, featuring a number of options from BMW’s Individual program of exclusive colors and materials, including a Frozen Orange Metallic paint as seen on the Z4 First Edition, Alpine White, Mediterranean Blue Metallic, Mineral White Metallic, Glacier Silver Metallic and Black Sapphire Metallic, will follow the 2019 Z4 M30i later this year with a base price of $64,695.